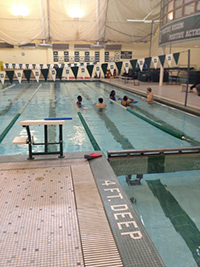 WaterWorks is a swim program established by the Office of Institutional Diversity & Equity (IDE) in collaboration with the President's Office to provide an opportunity for Dartmouth College students, particularly students of color, to learn how to swim in a relaxed, peer-taught environment. WaterWorks meets every term and utilizes teachers from both the swim team and greater Dartmouth community to ensure the success of learning swimmers. Furthermore, swimmers will be equipped with swimming gear to expedite the learning process. So, are you interested in learning how to swim? Want to have fun while improving your technique? 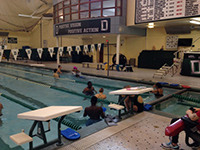 Like the idea of having a FREE swimming lesson from some of the best swimmers on campus? Come join us weekly at the pool in Alumni Gym! Invite your friends; all are welcome! It's FREE, so why not? On May 13, 2015, IDE hosted the founders of Josh's Project, an organization created to raise awareness on water safety and drowning prevention.